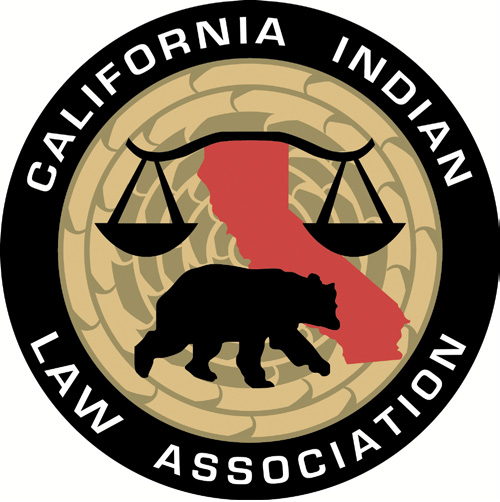 ​CILA is pleased to announce that registration for the 19th Annual California Indian Law Conference & Gala is now open! Register here. Please note that group rates will be available shortly, please check back soon! Thank you for applying for our scholarships! The California Indian Law Association (CILA) is proud to announce that we were able to offer two $5,000 scholarships to current Native American law school students to assist with law school expenses. These scholarships are made possible through a generous donation from the San Manuel Band of Mission Indians. 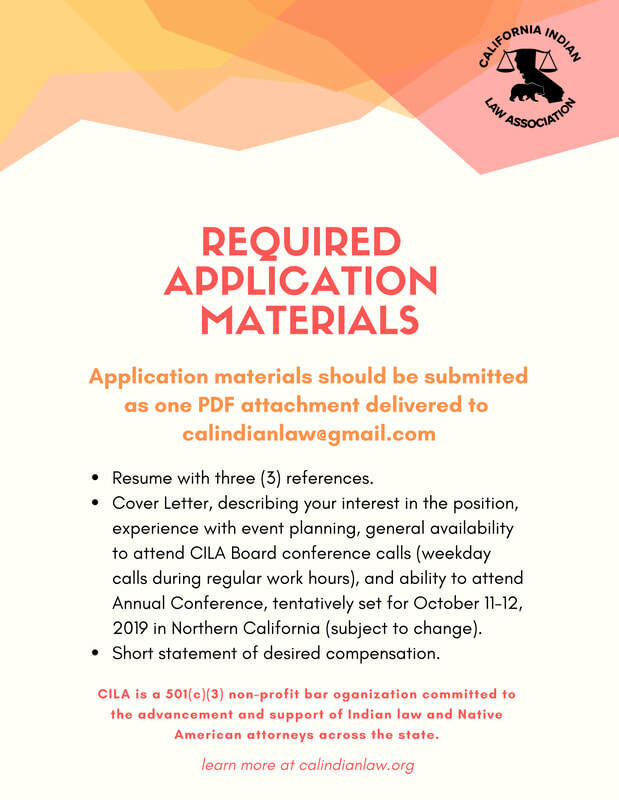 CILA is hiring a Program Coordinator! ​​Please see the flyer below and visit our new "Job Announcements" webpage for more information. Call for Articles for the 2019 CILA Legal Journal! CILA welcomes submissions for publication in its newsletter. If you are interested in submitting an article for the newsletter, please send us an email! Thank you for attending the 18th Annual CILA Conference and Gala! Photos and the conference program are available HERE or on the "2018 Annual Conference" page. CILA is proud to announce additional scholarships for current Native law students. These new scholarships are made possible through a generous donation from the San Manuel Band of Mission Indians. Thank you for supporting the next generation of Native attorneys in California! Read the latest edition of the CILA Newsletter here! The California Indian Law Association (“CILA”), has proudly partnered with the California Bar Foundation on a 3L Diversity Scholarship to be awarded to a graduating Native American law student preparing to take the California Bar Examination in 2018. 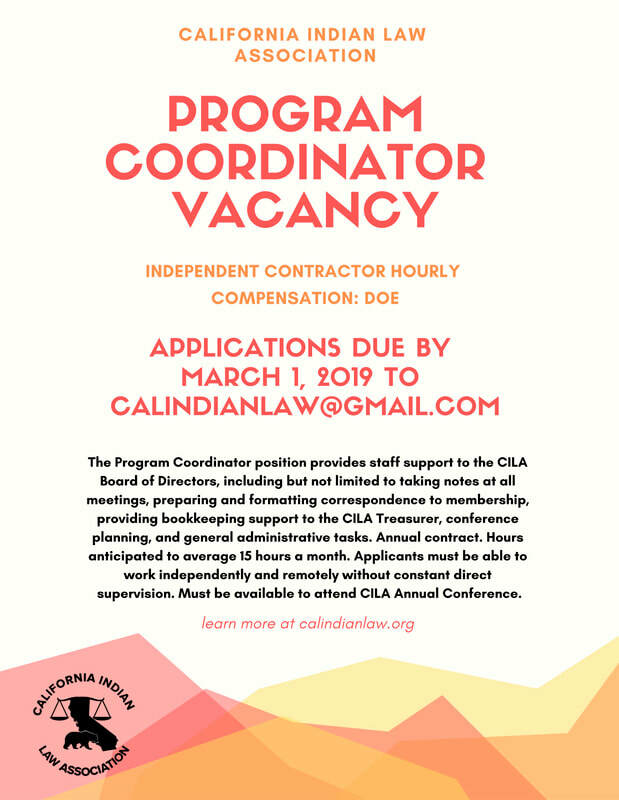 CILA is looking for an aspiring Native lawyer committed to a public interest career and serving Native communities. Applicants do not have to graduate from a California law school, but must be planning to take the California Bar Examination in 2018. I am very pleased to announce that the California Indian Law Association is now classified by the Internal Revenue Service (IRS) as a 501(c)(3) public charity. The IRS has informed us that, retroactive to July 6, 2017, charitable contributions to CILA may be deducted under Internal Revenue Code (IRC) Section 170 and that CILA is now qualified to receive tax deductible bequests, devises, transfers or gifts under IRC Sections 2055, 2106, or 2522. Please consult with tax professionals with any specific questions you may have about the deductibility of contributions to CILA. A special thank you is warranted to past CILA Boards and members for their contributions to this important achievement. Former CILA Presidents Christine Williams, Adam Bailey, and Courtney Cole most recently championed this initiative and helped put several important pieces into place prior to the submission of the application. We thank them, our past Board members, and all of you for the support that made this possible. Tax-deductible donations will allow CILA to expand our educational and professional development offerings to CILA Members and Native American law students. This year, CILA will once again co-sponsor a 3L Diversity Scholarship with the California Bar Foundation (CBF). CBF will match CILA’s contribution of $2,500 to provide a $5,000 scholarship to one Native American law student to assist with the costs of preparing for the July 2018 California Bar Exam. We are also currently developing our first CLE webinar for 2018, which is tentatively scheduled for a February or March timeframe. You will receive more information soon as we finalize the topic, date, and presenter(s). The CILA Board has many exciting initiatives planned for 2018. We appreciate your continued membership and participation in CILA, and wish you a very happy and productive New Year! California Indian Law Association, Inc.
Greetings! 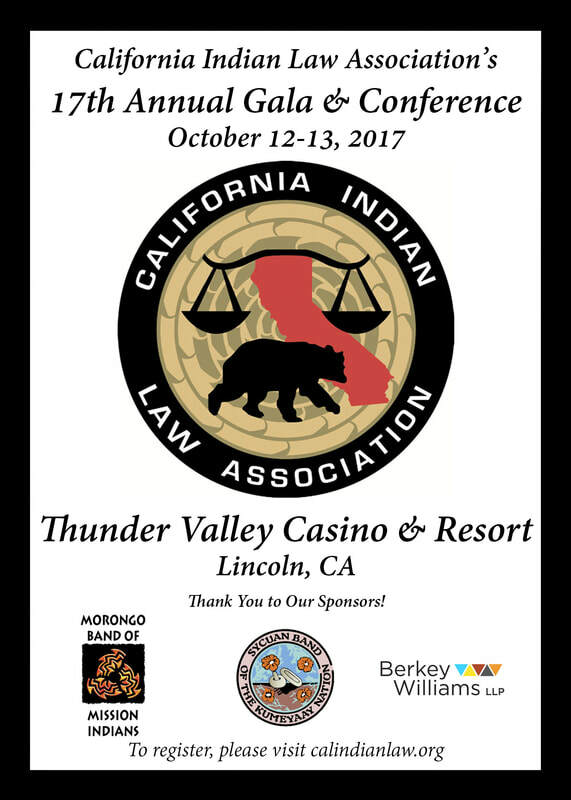 The California Indian Law Association (“CILA”) is pleased to announce that its 17th Annual Indian Law Conference & Gala will take place October 12-13, 2017 at the Thunder Valley Casino and Resort in Lincoln, California. CILA invites you to attend the Annual Conference and Gala. 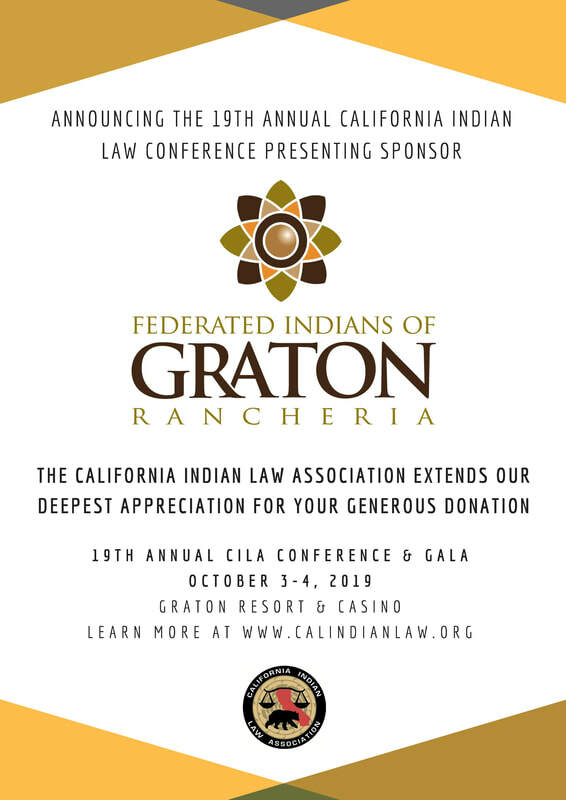 Further, on behalf of the California Indian law community, CILA’s Board of Directors humbly requests your financial support of the Conference through sponsorship. It is our goal to raise enough funds through sponsorship to cover all conference costs. Your sponsorship will enable CILA to continue to offer scholarships to Native American law students and promote the study of Indian Law in California. To commit to sponsorship, please send a competed version of the sponsorship form. If you have any questions, please feel free to contact Cheyenne Sanders at csanders@yuroktribe.nsn.us or Loretta Miranda at Lmiranda@berkeywilliams.com, the 2017 Conference Co-Chairs. The California Indian Law Association (“CILA”) is proud to announce its 2017 California Bar Foundation 3L Diversity Bar Review Scholarship recipient. CILA received an impressive pool of applicants from Native American law students representing California Native nations and Native nations across the country. CILA is proud to support the scholarship recipient by providing a free BARBRI prep course along with a cash living stipend. Congratulations to Jacklyn Velasquez for receiving CILA’s first ever 3L Diversity Bar Review Scholarship. Ms. Velasquez is a member of the Big Pine Paiute Tribe of the Owens Valley and will be graduating from Vermont Law School in May 2017. During law school, she has been active in her Native American Law Student Association chapter and returned to her tribe to complete two separate projects. Ms. Velasquez worked with the Big Pine Paiute Tribe Environmental Department on funding requirements for climate change, community outreach, and quality assurance projects, and researched the adverse impacts of a proposed large industrial scale solar project. After graduation and taking the Bar exam, she will work on tribal Clean Water Act issues as part of a two-year Equal Justice Works Fellowship in Madison, Wisconsin. After the fellowship, her plan is to return to California and work in Native law. Ms. Velasquez’s dedication to serving California Native nations, and specifically her own tribe, proves she will be an exceptional Native law attorney and CILA is proud to help support her through her bar studies. CILA extends a special acknowledgement and appreciation to the California Bar Foundation for matching funds for the scholarship and providing the leadership and infrastructure for these important 3L Diversity Scholarships. Culminating our four year effort to acquire information on the Solicitor General's 2011 confessions of error, CILA reached an agreement with the U.S. Department of Justice to bring an end to the Freedom of Information Act (FOIA) suit filed in April of this year. Click here to see a directory of CILA's current members. Become a CILA Member Today! Join our network of attorneys, scholars, and tribal leaders.